To this web site you are right now. This post will not be a primer to IPv6 - there are enough and better sources for this (see the Links section at the end). 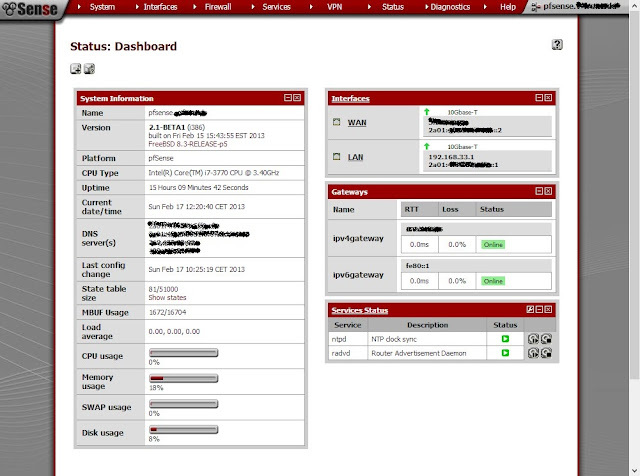 It is about how I implemented IPv6 in my hosted virtual lab, a project that I spent quite a few days on. So far I was only using IPv4 in this environment: I have one public IPv4 address assigned to the management interface of the physical ESXi host, and a second one assigned to a Linux VM that is running as a masquerading router and firewall for all other VMs (which use private IPv4 addresses). For more details read the first part of my SBHVL post series. This way I can provide Internet access to all VMs by using only one public IPv4 address. This saves me money (my hosting provider charges for every single additional IPv4 address), but NAT access has its limitations, and the VMs themselves are reachable from the outside only through port forwardings. IPv6 changes this: My hosting provider assigns a whole public IPv6 /64 subnet to every root server, and they even give you a second /64 subnet for free that is routed through the first one! This is a special offer for people who run virtual machines on their boxes, and enables you to have one VM that is an IPv6 router for all the other VMs. So this is similar to my IPv4 setup, but this time it is true bidirectional routing without the limitations of NAT! Linux - like every modern Operating System - does of course support IPv6, also to such an extent that it can be used as a decent IPv6 router. So my first plan was to use the OpenSuSE VM (that was my IPv4 masquerading router) also for implementing IPv6 connectivity. However, when I looked for configuring and managing the needed services through nice GUIs (rather then via error prone command line tools and manually editing text files) I found that the available YaST tool does not really support IPv6. It is capable of much more. I encourage you to look at its feature list if you consider doing something similar. The Linux box that used to be the IPv4 NAT router before still exists, because it also runs web services that I want to keep separate. It still runs my DNS service (pfSense implements DNS forwarding only) and DHCP services for both IPv4 and IPv6 (I plan to migrate this to pfSense later). IPv6 is designed to support stateless address autoconfiguration (SLAAC) without the need for a DHCP server. Each client will then autoconfigure a valid IPv6 address based on the router advertising the right subnet prefix and his own address as a default gateway. However, I need to make sure that each VM always gets the same IPv6 address, because these are used in firewall rules. This is also possible by using a DHCPv6 server with address reservations - this method is commonly referred to as stateful autoconfiguration. The full discussion is here on the MS Technet forums. VMware Zimbra does not support IPv6 by default. A post in the Zimbra forums explains how to enable it. The BitNami ownCloud stack is affected by a bug in the underlying Ubuntu Linux (at least version 12.04): If it is configured to get its IPv6 address from a DHCPv6 server then it won't pick up the default route from radvd announcements. Here is the bug report and a work around that solved the issue for me. I learnt a lot (not only) about IPv6 while implementing it in my hosted virtual lab. And it reminded me of the fact that "Learning by doing" is far superior to only theoretical studies. It's faster and makes much more fun! I strongly recommend looking at their materials if you are an IPv6 newbie and/or want to dive into this topic!